It is widely believed that the practice of ancient Egyptian religion ceased with the end of pharaonic culture and the rise of Christianity. 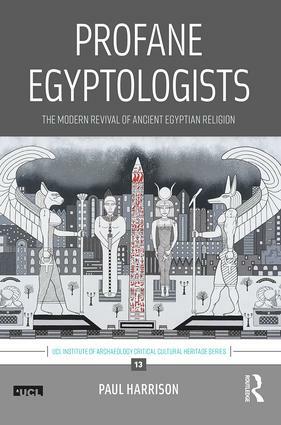 However, an organised reconstruction and revival of the authentic practice of Egyptian, or Kemetic religion has been growing, almost undocumented, for nearly three decades. Profane Egyptologists is the first in-depth study of the now-global phenomenon of Kemeticism. Presenting key players in their own words, the book utilises extensive interviews to reveal a continuum of beliefs and practices spanning eight years of community growth. The existence of competing visions of Egypt, which employ ancient material and academic resources, questions the position of Egyptology as a gatekeeper of Egypt's past. Exploring these boundaries, the book highlights the politised and economic factors driving the discipline's self-conception. Could an historically self-imposed insular nature have harmed Egyptology as a field, and how could inclusive discussion help guard against further isolationism? Profane Egyptologists is both an Egyptological study of Kemeticism, and a critical study of the discipline of Egyptology itself. It will be of value to scholars and students of archaeology and Egyptology, cultural heritage, religion online, phenomenology, epistemology, pagan studies and ethnography, as well as Kemetics and devotees of Egyptian culture. 4. Power Station, People's Opiate, or Proof of Piety? 12. Discussion- Contested Resources or Continuum? Paul Harrison gained an MA and PhD from UCL, where he is an Honorary Lecturer for the Institute of Archaeology. He has appeared on the History Channel and Sky News as an historical expert, and lectured at UCL and the British Museum. His areas of research include Egyptomania, public engagement, political appropriations of the past, spirituality and the occult, and the intersection of history with ethnicity. His recent work focuses on historical communication in print and media. He is currently working on his second book and finishing a documentary based on archaeological conservation.